The playing season runs from April to October. The Club enjoys a full programme of fixtures. The Men's Section play in four different leagues: on Wednesday and Friday evenings, and in two leagues on Saturday afternoons. The Veterans play in a Monday afternoon league, and have in-club games on a Wednesday afternoon. The Ladies play in leagues on Tuesdays, Thursdays and Fridays, and can also play in the men's and veteran's leagues. All sections hold knock-out competitions and a number of members enter League, County and National competitions. The Club holds regular Open Competitions including a Pairs Competition on the Sunday and Monday of the May Spring Bank Holiday. 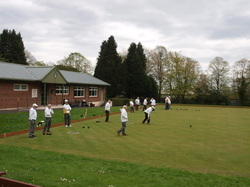 Carpet bowls is played in the Pavillion during Winter months (October to March).